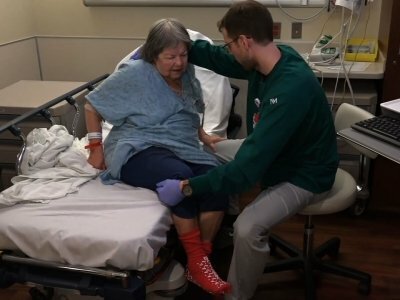 CHICAGO (AP) — When 86-year-old Carol Wittwer took a taxi to the emergency room, she expected to be admitted to the hospital. She didn’t anticipate being asked if she cooks for herself. If she has friends in her high-rise. Or if she could spell lunch backward. Wittwer’s care is part of a new approach to older patients as U.S. emergency rooms adapt to serve the complex needs of a graying population. That means asking more questions, asking them earlier and, when possible, avoiding a hospital stay for many older patients. The surprising truth? Hospitals can make older patients sicker. Infections, incontinence and weakening muscles from bed rest can cascade into delirium, frailty and death. More than 30 percent of older adults go home from a hospital stay with a minor or major health problem they picked up at the hospital. But for an ER doctor, sending an elderly patient home sometimes feels risky. One of his patients, Marvin Shimp, 87, has lost much of his vision to macular degeneration, but lives independently. Dobschuetz helps him stay out of the hospital with regular visits to check vitals and answer questions. “He becomes quite a helper,” Shimp said. Emergency rooms have been called the hospital’s front door, so that’s where reformers are starting. Early research at Northwestern and other hospitals shows care from geriatrics-trained nurses in the ER can reduce the chances of a hospital stay after a patient’s emergency visit and for a month afterward. About 100 hospitals in the United States have opened geriatric emergency departments or trained ER teams in geriatrics care. These teams can arrange home services such as light housekeeping or a break for a caregiver. In June, for instance, a man in his 90s arrived at the emergency department at University of California, San Diego’s La Jolla medical campus. His left arm and shoulder hurt. He couldn’t stand because of weakness and pain in his left foot. Geriatric emergency nurse Tom Crisman learned the man was a veteran who had outlived his wife and son. The man was eager to get home because he now cared for a daughter with Alzheimer’s disease. Crisman identified caregiver strain, weight loss and swallowing difficulties. His patient was in danger of falls and malnutrition. But the man was lucky in a way, Crisman said. Crisman organized home physical therapy for the man, connected him with a nutritionist and speech therapist and invited church members to help with the resource planning. “They were treated like family,” Crisman said. This kind of emergency medicine is only about a decade old. An influential 2007 article described the emergency department of the future, designed to prevent confusion and falls in the elderly and to increase their comfort. It would have windows and skylights instead of windowless spaces with glaring bulbs. Pressure-reducing mattresses instead of thin ones. Soundproofing. Above all, it would hire nurses trained to untangle the complex complaints of aging, slowing down the frenetic pace of the ER enough to fully evaluate each patient. Physical therapists and pharmacists would be ready to help out. Now, the ideas are catching fire. Northwestern’s geriatrics ER has soundproofed rooms with comfortable beds and windows. Hospitals in New York, New Jersey, Pennsylvania, North Carolina, Wisconsin, Illinois and Georgia formed a collaborative to share ideas. The latest nudge is an accreditation program, launched this year. “We want to have at least 50 certified hospitals by the end of 2018,” said Dr. Kevin Biese of University of North Carolina at Chapel Hill School of Medicine, who leads the accreditation push for the American College of Emergency Physicians. With Medicare penalizing health care systems for unneeded care, hospitals have financial incentives to change. Older adults in the emergency room use more resources and are admitted to the hospital more frequently than other age groups. Northwestern’s GEDI team — it’s pronounced “Jedi” like in “Star Wars” — regularly works beyond the scope of a traditional emergency department. Last March, the team helped sort out guardianship issues for a woman in her 70s with severe dementia whose caretaker daughter was severely sick. In November, they organized hospice care for a man in his 70s who was dying of pancreatic cancer. In December, they helped a woman in her 80s get a spot at her preferred rehabilitation facility, first making sure that Medicare would cover the cost. Wittwer, the Northwestern ER patient, might have been admitted to the hospital before the GEDI program. Instead, the team set her up with home visits from a nurse and a physical therapist.